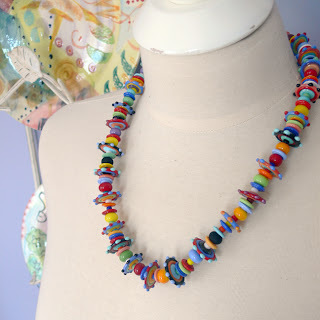 Pretty Things: How About Some Color In Your Life? Very unusual and so pretty! LOVE both of those necklaces!!! Great job! Lori, both necklaces are AWESOME! Different colors for different moods. Beautifully designed dear! Love the Crayola colors. Hope they both find a loving neck soon. Cute as can be!! I really love the second one. You could wear it with anything and everything all summer long. Pretty! What beautiful necklaces I can't decide which 1 I like better. They must take hours and hours of work. Holy moly!!! Love, love, LOVE them both! Wow! Look at all that lampwork glass. What beauties! The colour in both of these is amazing. Just absolutely love how vibrant these are. I love the pastel ones. That must ahve taken forever - are those all glass beads? I can imagine how heavy it must feel wearing those. Lori - Those are wonderful!! They are wonderful, Lori!!! I love the cheerful colors you've used! Lots of sunshine in those beads! i don't usully like lampwork beads, but these are so pretty! 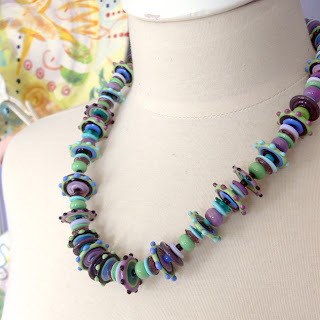 unless it's a secret, can you share where you get such great lampwork beads.............or get beads, period. your necklaces are so precious - i like the pastel one the best! I think these necklaces are beautiful. I would like the pastel and my daughter would adore the crayola (clever name incidentally). The question is, when will you start exporting to South Africa ??? Amazing - I love them. Those are lovely! I can't decide which one is prettier. ;) Thanks so much for the visit! absolutely amazing!!! your beads are so wonderful - do you sell any of the designs as separate beads?? Wow! I really love these two necklaces! They probably are better than prozac!